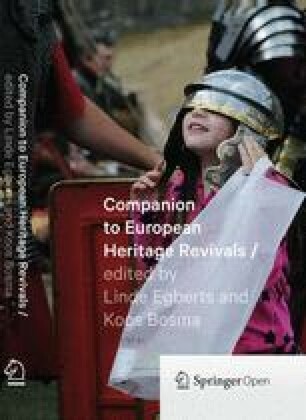 For international heritage revivals within Europe, the concepts, strategies, and policies of the European authorities are usually very important. Not only does the European Commission stimulate international cooperation in the field of shared heritage and identities; it also creates a framework for these projects, since many heritage networks, platforms, and co-operative efforts are established at the European scale. In addition, it provides the necessary economic and political liaisons. Therefore, it is important to gain some insight into how European cooperation and the idea of European identity have evolved. Today’s Europe was shaped by the wish to bring lasting peace to the continent. We would not need pan-European governance if the diversity between countries and cultures was not as large as it is, and thus diversity is a core element in the project of European identity: the attempt to create a shared notion of identity among the citizens of the member states. As we will see, most international heritage policies, projects and selections are based on national interpretations of the past. In practice, it appears to be extremely difficult to select and represent heritages in a truly international manner. In the second part of this chapter I will focus on one particular European region, Alsace, which was literally at the heart of the decades-long German-French conflict that only ended with the Second World War. Strasbourg, the capital of this battlefield region, became one of the centers of the European Union, as a symbolic and physical confirmation of European peace. The development of a strong sense of regional identity in Alsace is an interesting example of how heritage is employed to construct a regional identity. This is illustrated by a brief analysis of three places which were important in the early Middle Ages. The way in which this local heritage is treated illustrates how heritage works in practice and is used for “identity” projects on different scales. The European Union was initiated around 1950 with the creation of the European Coal and Steel Community. It was seen as a means of preventing another war in Europe; for it would encompass two key industries necessary to create military build-ups. Since then, the European Union has gone through several phases of expansion and institutionalization. The current European Union (EU) was established with the signing in 1992 of the Treaty of Maastricht, and after 2000, the Euro was introduced, though a European constitution was turned down by referendums in number of countries. In the area of international policies regarding heritage, UNESCO World Heritage, part of United Nations, is of course the major institution. Its strategy focuses on selection through the national heritage commissions of the member states. As a consequence, its international list reflects the self-images of these countries and the aspects of their culture they find most valuable from that particular perspective. Despite the presence of relatively many heritage objects in Europe on the UNESCO World Heritage List, most of them reflect national self-images and historical epochs in history that were important to the formation of the different European nation-states. For example, the list is filled with castles and cathedrals of the Gothic and Romanesque periods. Less well represented are sites from earlier ages, as well as reminders of the European scale of the ambitions of former rulers such as Napoleon, Charlemagne, or the Roman emperors. The dark side of Europe – crises, conflicts, wars, and the Holocaust, all essential formative factors of Europe’s history – is under-represented on the UNESCO List. 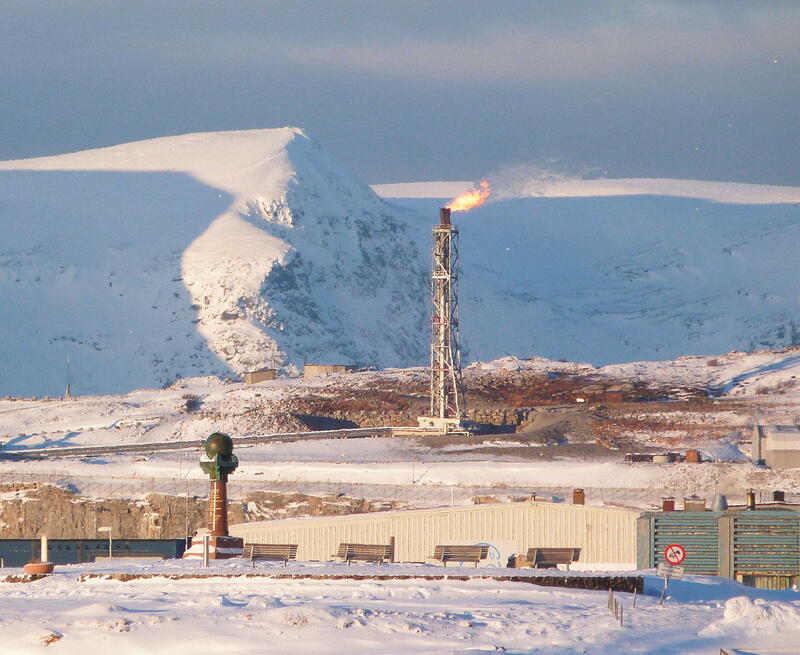 One of the Struve Geodetic Arc Monuments (1816 - 1855), Hammerfest, Norway (Daniel Fischer, 2011). The criteria used by the European Commission stress the importance of a site’s symbolic value in European terms and its relevance to Europe in the past as well as in the present; it must have a pan-European or cross-border character as well as a connection to European events, movements, or people.7 The emphasis on tangible heritage and the lack of participation is a classic approach. Significantly, and somewhat in contradiction to its international character, all the sites on the list have to be pre-selected at the national level. As a consequence, national criteria and ambitions primarily determine which sites receive the European label and which sites do not. There are also many other European initiatives and institutes involved in the selection, preservation, interpretation, and presentation of European heritage. 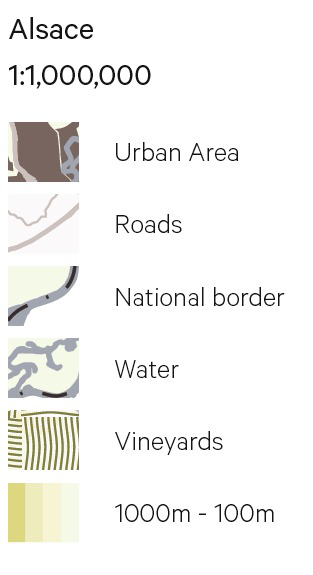 One of them is the European Institute of Cultural Routes, which fosters the de-velopment of cultural routes on a broad range of themes in order to create common memories and strengthen European solidarity through the activity of travel.10 Nevertheless, a lack of monitoring has left us without a clear picture of the uses and effects of these routes. Summarizing this brief impression of European heritage policies, I want to stress the fact that national interpretations of the past are dominant in deciding how shared heritage is selected and represented. European heritage is consequently often simply a sum of national interpretations of the past. The question remains of whether this truly advances the project of European identity. In this chapter, I would like to go slightly further into detail on how heritage works on a regional scale, without losing sight of the European context of heritage practices. My example is the use made of the past in a region in the heart of Europe which possesses an important symbolic value for the continent as a whole, namely Alsace. Not only does this small region in France border Germany; its very existence is bound up with being the border area in which Roman and Germanic cultures met. The division between Franconian and Germanic languages and cultures stems from the late Roman and early medieval periods and is still at the core of the region’s identity. Borders like this one are often fought over, and in the past, Alsace (or Elsass) has, at different times, been dominated by both German and French rulers and has been a subject of conflict as well as buffer zone since the Early Middle Ages. This in-betweenness was most dramatically evident between 1870 and 1945, when the Alsatians changed nationality no less than four times. Alsace’s role as a contested border region in the heart of Europe gained symbolic meaning in the postwar period when over twenty European institutions chose Strasbourg as their base, including the European Council and European Parliament, which are also partly seated in Brussels. In this European battleground region,11 the Alsatians became very much aware of their own identity and promoted a sense of regionalism to be able to better withstand the fierce blasts of partisan cultural politics coming from both the French and German sides. As in many regions and countries across Europe,12 the Alsatian middle class started studying, conserving, and collecting regional (mostly rural) folklore, literature, art, architecture, and other forms of heritage. In the case of Alsace, French patriotic sentiments among members of the middle classes and protests against the German rule went hand in hand with the “musealisation” process of Alsatian regional culture. After the First World War, French rule did not bring the population what it had hoped for, and this same regional heritage was used to offer a counterweight to French cultural politics. Since then, care for its heritage has been closely related to the region’s traumatic recent past and its attempts to remain truly Alsatian in the midst of war, conflict, and cultural oppression. What most strikes the visitor about today’s Marlenheim is its viticulture: the hills around it are covered with vineyards. In the village about ten caves offer their products and wine-tastings, and the internationally known Alsatian ‘route du vin’ brings many wine lovers to the village every year. Nowhere in Marlenheim is reference to be found to its rich past, the presence of kings and a royal palace, or of the mystery in which the story is shrouded. The only way Marlenheim refers to its royal past is in the names that were given to the streets in a new residential area that has been developed since the 1970s. The village’s opportunities for heritage development are endless. What is no longer visible can be made so by reconstructions, exhibitions, festivals, artistic projects, and so forth. None of these things have happened yet in Marlenheim. Apparently no one thinks that it is important to make them happen. 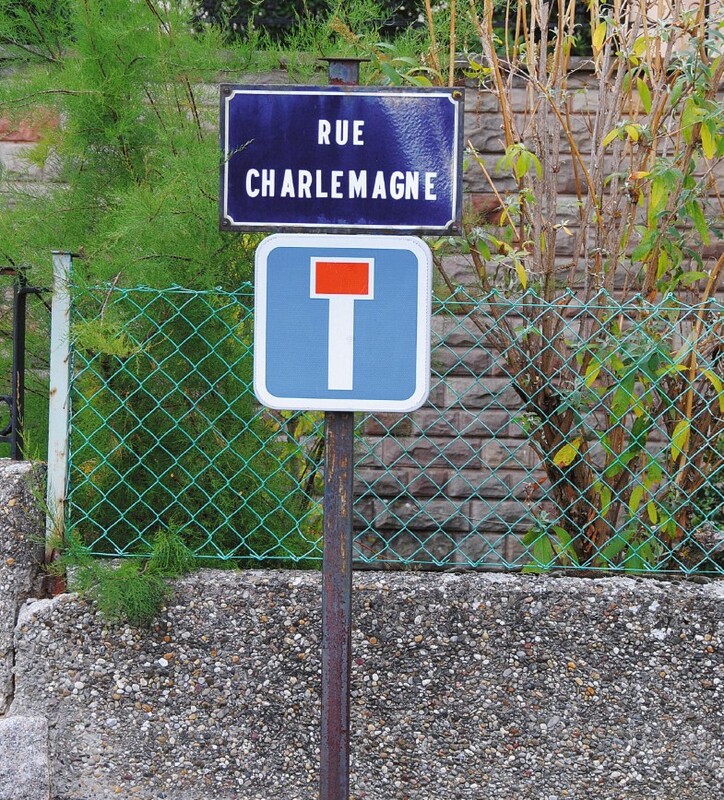 In Marlenheim, France, only a street name refers to Charlemagne (Linde Egberts, 2012). Leaving the plains of Alsace and entering into the hilly Vosges area, one enters a narrow, wooded valley right under the ‘Grand Ballon’, the highest mountain of the Vosges. After passing the last houses and under the gateway, the road leads to the former abbey of Murbach. Just as a millennium ago, the abbey of Murbach lies in a remote place, hidden away from business, the tourism industry, and traffic. Even religious life has almost come to a standstill there, as the monks have left the abbey and mass is said only once every few weeks. The scale of the complex and the impressive remaining westwork of the former abbey give a hint of the importance and wealth of the abbey in the early medieval period. But as for the rest, the rich past of this historic abbey is left in oblivion. The monastery was built, extended, destroyed, abandoned, and rebuilt several times in the course of its history. In the eighteenth century, the monks temporarily left while it was being reconstructed but then decided not to return when the work was completed. Shortly after that, their monastery was suppressed in the French Revolution,23 and the monastery complex was demolished, together with large parts of the abbey. The remaining westwork was turned into a parish church, which was listed as a monument by the French authorities in 1840.24 Now, the church is maintained, and the organ restored, but one wonders who comes to hear it played. Today, the peacefulness of the abbey and its wooded surroundings are valued as one of its main assets. The small local community has therefore actively tried to keep the area free of tourism.25 The only way tourists are made aware of the abbey is through descriptions in travel guides or by following the tourist route of Romanesque architecture in Alsace, of which Murbach is one of nineteen itineraries.26 Since the disappearance of the monks, there has been enough interest in the abbey to keep it (at least partially) standing up, but no one has appropriated it for new purposes or attempted to draw attention to its regional importance. It is literally left on the margins. Until now, it seems that little importance has been given to early medieval sites in the history of Alsace, even though they link the region’s past to that of many other parts of Europe and to Europe as a whole. Marlenheim and Murbach (and perhaps also places like Colmar, Sélestat and Strasbourg) do not appear to actively recall the memory of the Merovingian and Carolingian epochs as there seems no desire or necessity to do so. There is, however, a place in Alsace whose early medieval past plays the leading role in the story of Alsatian identity and memory – a “history in the heart of history”. 27 It is a place that dominates Alsace in a very literal and symbolic way. Mont Sainte Odile is the home of Alsace’s patron saint, who overlooks the plains of Alsace from her mountaintop location. What is the reason for this dominance? The answer is that the Church and the faithful, artists, and rulers all actively remembered it. They preserved, appropriated, and changed this heritage and have kept on attributing meaning to it up through the present day. The partially restored abbey of Murbach, France, in its quiet, wooded valley (Linde Egberts, 2012). The convent of Ste. Odile, France, is a popular place of pilgrimage and offers a view of the entire region on clear days (Linde Egberts, 2012). Ste. Odile was supposedly the first abbess of the convent, and it is where her remains are kept, as are those of her father Adalrich. The biography of Ste. Odile, written in the early tenth century, attributes several miracles to her, and her fame grew and spread through large parts of the Holy Roman Empire. The convents of the mountain were inhabited, devastated, abandoned, and reclaimed several times – as was the case in Murbach. Beginning in the late seventeenth century, Ste. 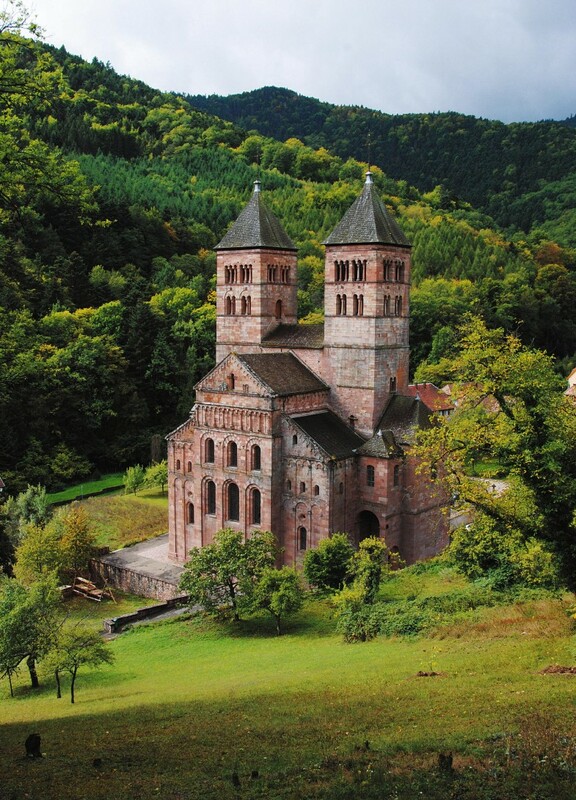 Odile was promoted as the symbol of Alsace and the mountain as the soul of the region.28 It grew into a place of pilgrimage and was venerated by Catholics and Protestants alike. Having discussed individual historical sites in Alsace, I will now turn to the role of touristic and heritage routes in this area. Mont Ste. Odile is an historic place of pilgrimage, for which trails exist in the surrounding area. But the mountain is not part of a larger network of trails or heritage routes. 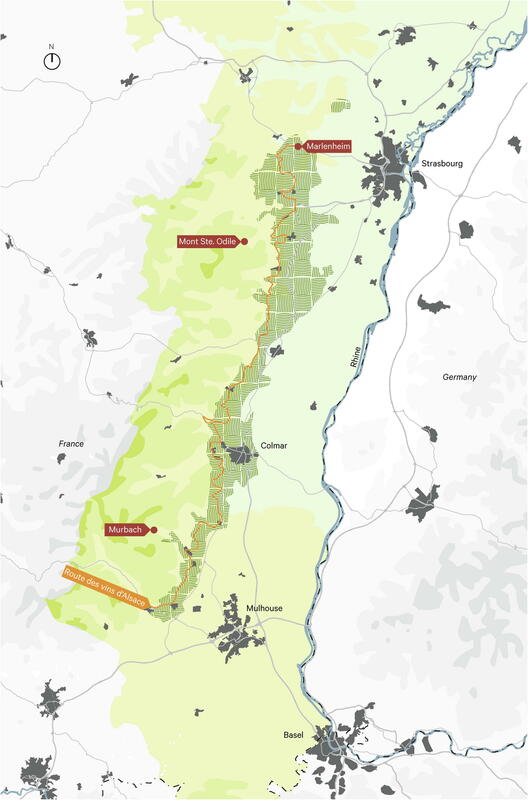 What is true for Marlenheim, is also true for the entire Alsace region: its tourism relies heavily on the Route des vins d’Alsace, a 170-kilometer long route which meanders along the edge of the Alsatian plane and the foothills of the Vosges. The route is over sixty years old and well known among wine-lovers worldwide for its picturesque villages and wine tasting along the way. The visitor is expected to travel by car but is also offered local hikes passing through vineyards and places of local historical interest. Educational wine trails, too, are very common in villages and towns along the route, which is maintained with markings in the field but also has an extensive website suited to the needs of 18 different languages groups/nationalities (including a promotional film in which national wine experts are interviewed). Travel books, group trips, and a smartphone application have been made to improve the accessibility of the route. Well integrated into a communication strategy in which wine producers present themselves and annual traditional wine festivals are promoted, the wine route in Alsace has successfully combined the commercial interests of Alsatian local wine-makers and the tourist’s desire for meaningful experience.33 A need to travel through the historic Alsatian landscape is generated by gastronomic, cultural, and educational offerings. In the north, the route starts in Marlenheim, passing through Ottrott at the foot of Mont Ste. Odile and through Guebwiller near Murbach further to the south. 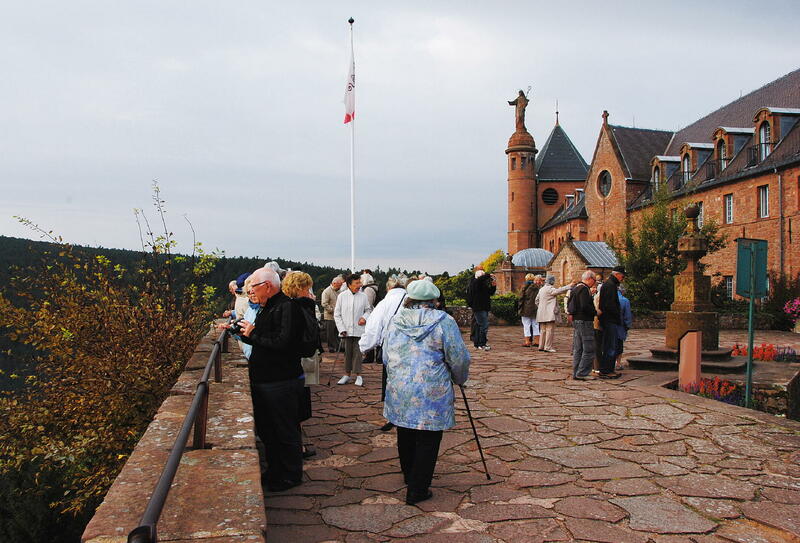 There are other touristic routes in Alsace with a more historical focus, such as the Route Romane d’Alsace, which promotes Romanesque architecture and medieval music in Alsace. 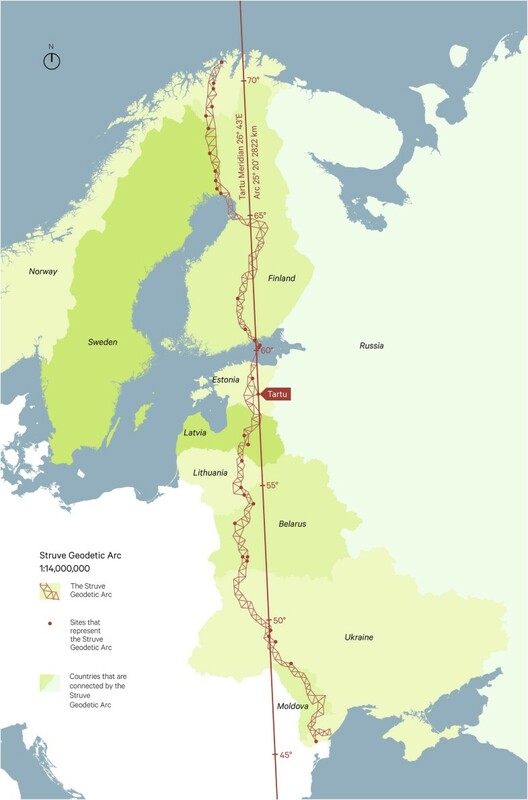 Although the actual route is marked, its online presentation is rather poor and very out of date. The hugely successful example in this group is the Route de Crêtes, an historic, 77 km-long trail along the ridge of the Vosges Mountains. After the Franco-Prussian War (1870 – 71), this ridge became the border between Germany and France. The road was developed by the French in the First World War to connect the Vosges valleys. Today it is used by hikers (Grande Randonnée 5), cyclists, and motorists, who are treated to panoramic views of the region and beyond. The route, it should be noted, has no website, nor is it promoted by any single organization as a cultural itinerary. The perspective from which the history of Alsace is studied and interpreted is determined by the conflicts between France and Germany after 1870 and the impact of those events on the region. The approach to the region’s heritage is also governed by this perspective on the region’s past: it is interpreted through the lens of war and conflict between these two major powers. The early medieval period is most often seen as part of the region’s pre-history, in which the roots of its identity – in terms of toponomy, geography, and language – were formed. The heritage from this period is preserved only very selectively (as happens in many regions). Merovingian and Carolingian kings and their palaces do not seem to have evoked much interest in modern-day Alsace, as the case of Marlenheim-Kirchheim has shown. No monuments, reconstructions, festivals, or other references to them are to be found, except for the naming of several new streets after historic groups and figures. The brief analysis of Murbach showed that one of the most powerful monasteries in the region in the Middle Ages is largely demolished and is now maintained as a parish church lying at the far periphery of historic consciousness in the region. The major exception to this all is the Mount of Ste. Odile. The saint’s memory is anchored in this ‘lieu de mémoire’ by her relics, as well as in many paintings, sculptures, churches, plays, songs, poems, books, and, not least, in the ceremonies and pilgrimages that are performed repeatedly throughout the year. Ste. Odile’s heritage has proved to be malleable enough to be valued by pro-German, local patriotic, and pro-French parties; she spoke an old version of German and was initially adored in the German world, but later even more so in France. Beyond that, she has been able to transcend her role as a Catholic saint and become the patroness of a multi-religious region. In this chapter, I discussed European heritage policies in relation to the idea of a shared European identity, based on unity in diversity. I also illustrated how some parts of the early medieval past are forgotten or, at best, of marginal interest, while other parts are re-used, having been adapted to fit new roles and purposes. This is how heritage is preserved and passed on from one generation to the next: by appropriation and change, related, very often, to changing power relations. Creating new heritage revivals on an international scale requires adding a new layer of meaning to an already dynamic heritage.